Each year, ISE is home to thousand of pro AV product launches. Here are the display products you need to see at the 2019 show. Available in 43", 49", and 55", Peerless-AV’s Xtreme High Bright Outdoor Displays feature the widest operating range, a fully sealed IP68-rated design, full HD 1080p resolution, and IK10-rated cover glass. 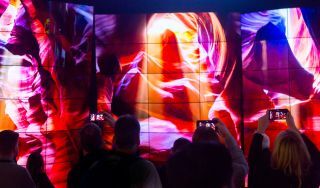 At 219”, The Wall is the next generation of display technology, pairing a revolutionary viewing experience with the ability to configure the display into nearly any shape or size. On show for the first time, NEC is showcasing their Free standing LED solutions for meeting and board rooms as well as for digital signage – available in various sizes and pixel pitches. Sony’s Crystal LED display is an awe-inspiring, bezel-less system which creates an immersive viewing experience and delivers ultra-realistic content at any size – the perfect solution for any large-scale environment. LED video walls are designed to meet the fast-paced needs of rental and staging and large venue applications. Delivering fast assembly and easy-access electronics, Leyard VVR Series features magnetically-attachable cabinets with a quick-lock system for single-person handling. Available in 3mm, 4mm, and 5mm, Absen’s N Plus series offers cutting edge lightweight aluminum die-cast cabinet design for easy installation and creative application, as well as smart remote monitoring and diagnostic for real-time performance tracking and failure detection. Available in 43", 49" and 55", Peerless-AV’s Xtreme High Bright Outdoor Displays feature the widest operating range, a fully sealed IP68-rated design, full HD 1080p resolution, and IK10-rated cover glass.